As you may have learned in other articles, you create an index in your documents by placing the special index field in your document. When you insert the field you can indicate how you want Word to separate the alphabetic sections of your index. There are several choices you can use, but you may need to experiment to find the dividers that are right for you. You specify these dividers by adding the \h switch to your index field. The table below shows some possible settings for this switch. You can now experiment and see what works best for you! Obviously, a Word document is not a spreadsheet, but you can treat it like one (kinda) by adding a toolbar button that will allow you to quickly calculate values in your document based on numbers in a selection. For example, you could highlight text such as 12*14+2 and quickly calculate that the answer is 170. Display the Word Options dialog box by displaying the File tab of your Ribbon and then click Options. At the left-hand side of the dialog box select Quick Access Toolbar. Locate and select the Calculate command in the list of commands. Click Add . The command will move to the right side of the dialog box. To use the tool, all you have to do is highlight the expression you would like to calculate, and then click on the tool. Word will show the calculated value in your status bar, and place the value in your Clipboard. You can now paste the value any place you like. On some occasions, you may want to use a slashed zero in your document. Very often, they are used in technical documents to delineate a zero from the capital letter O. Should you want to use this character, you have two choices. Firstly, you can find a font that actually uses the slashed zero in it. If you use this character a lot, this is probably the best solution. Place your cursor where you would like the slashed zero to appear. Click Ctrl+F9 to insert field braces. Click Shift+F9 to collapse your field and the slashed zero will appear in your document.. Very often macros are used for processing a document. It is fairly common to have a macro step through all the paragraphs in your document and make changes based on the information in the paragraph. If you need to step through all the paragraphs in a document, it is helpful to find out how many paragraphs there are. The Paragraphs collection contains all of the paragraphs in your document, each in its own object. The Count property returns a value indicating how many objects (paragraphs) are in the collection. In the example above, this value is assigned to the iParCount variable. You can then use this count in doing any processing you need to. Please note, that paragraphs can be empty in Word. If you key in some information and then click the Enter key two times, you have just created an empty paragraph with that second Enter click. This increases the paragraph count, so it is always good to have your Show/Hide enabled so that you see non-printing characters in your document if you are trying to figure out how VBA reached the paragraph count it did. The rule is that each click of Enter will result in a new document paragraph. Many thanks to Allen Wyatt for the macro in this newsletter! If you want to quickly count the number of paragraphs in your document, there is an easy and straightforward method to accomplish that. Be certain you have saved your document. Click Ctrl+Home to go to the beginning of your document. Click Ctrl+H. 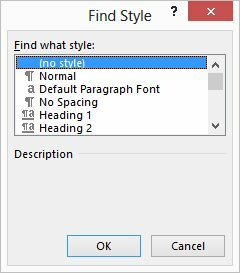 Word displays the Replace tab of the Find and Replace dialog box. In the Find What box, key in ^p. In the Replace With box, key in ^p. 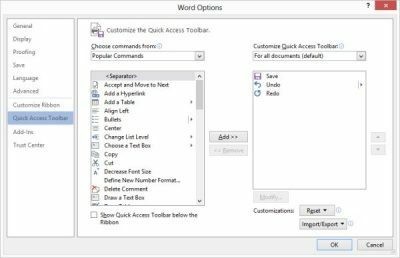 Word will replace all the paragraph marks in your document with identical paragraph marks, and display a dialog box indicating how many replacements were made. The number of replacements is the number of paragraphs. This particular method may not impress you all that much since you can also find out the number of paragraphs in your document by displaying the Statistics tab of the Properties dialog box. BUT, the real power comes in when you want to find out how many paragraphs you have of a certain style. You just need to expand your search a bit. For example, suppose you have a certain paragraph style that you use only for numbers. Click Ctrl+H. 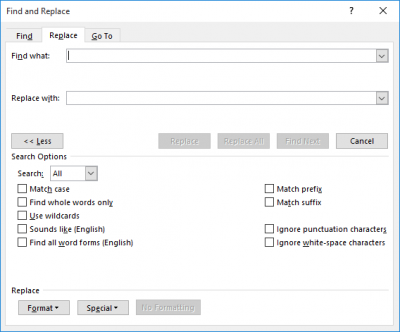 Word will display the Replace tab of the Find and Replace dialog box. Click on More, if it is available. Select the name of the style you used for your numbers. This is about a feature that was always in high demand and in 2002 Microsoft included it! Should you need to copy non-adjacent selections of text in your document or apply special formatting to your headers for instance, this is the best method for doing so. Use your mouse to make your selections in your document. That’s it! Quick and easy but you would be surprised how many folks aren’t aware of this little tip that makes their lives so much easier!